Get your dog ready for tick season the natural way! When our local alternative health publication, Second Opinion, asked me to write about essential oils for your dog in their current pet issue, I knew exactly what I wanted to write about. Ticks!! I hate having to put poison on the back of my dogs’ necks every month during tick season, and if you’re diligent about using the essential oils mentioned in this article, you shouldn’t see any of those nasty creatures attaching themselves to your beloved fur-baby. You may think it’s too early to be talking about tick prevention, but for Wisconsonites, ticks and tick-borne diseases are never far from a dog owner’s mind. It is estimated by the CDC that up to 53% of all dogs who live in areas of our state (Northern and Western) where Lymes is most prevalent could be infected. 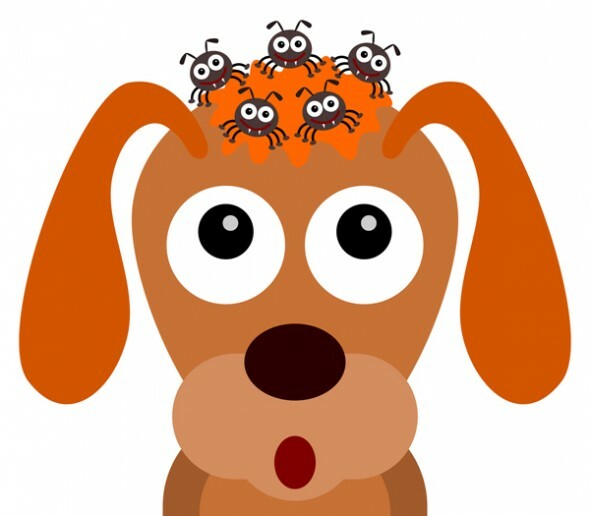 Ideally, it is much easier to prevent a tick bite than to have to treat the disease once transmitted. There are a myriad of products sold over the counter to repel ticks and fleas, but those of us who would rather not put a deadly chemical on our beloved pets are always looking for natural alternatives. Essential oils (EO) are ideal an ideal solution. EO may be applied by spritzing your pet or by directly applying a diluted oil to their fur. First, be sure that you are using therapeutic-grade pure essential oils, and when using on your pet, always dilute at a ratio of 2-3 drops per tablespoon of carrier oil (olive, coconut, jojoba, almond). There are several oils that have been proven to repel ticks (and fleas) and can be used on humans, dogs and horses. Most, however, cannot be used on cats. These oils are rose or rosewood, geranium, peppermint, grapefruit, myrrh, pennyroyal and Palo Santo (a Young Living EO blend). Also, peppermint oil (undiluted) can be used to force a tick to release without leaving the head in your pet. If your pet is unfortunate enough to contract Lymes Disease, your veterinarian will undoubtedly want to oversee their treatment with antibiotics, which is the only known cure. However, you can facilitate your pet’s recovery with oregano and peppermint oils, both of which contain anti-fungal and anti-bacterial properties. Just place a couple of diluted drops of either or both on your dog’s ears and inside the pads of their feet. And remember to learn the symptoms of Lymes so you can catch it early in your pet. These are stiffness, achiness or swelling in one or more joints, fever, fatigue, loss of appetite or a stiff walk with arched back. Consult your veterinarian immediately should you suspect your dog has been infected. We use yeast everyday, or at least it’s usually in what we eat, but a yeast infection in dogs can be not only uncomfortable for your dog, but grow into something worse. This time of year when everything seems to be damp does not help. Some of my clients, as well as so many of the rescue dogs I see coming in have ear infections, usually caused by a yeast overgrowth. Antibiotics do not help this sort of infection. It is not bacterial, but fungal. So, here are some natural remedies for treating and helping to relieve the itch of yeast infections, primarily for the ears and paws. Oh and if you’re wondering if your dog might have an overgrowth of yeast, try giving them a sniff. Some people say it smells moldy or musty, but there could also be a popcorn or Frito type smell, as well. A vet can tell you for certain by taking a skin culture and testing it. Diet: Naturally I’m going to address this first. The proper diet can manage so many issues that people commonly think require medication as a first option. Fungal infections are no different. Yeast thrives and grows on sugar. That means cutting all sugar products and by-products from your dogs diet. Ideally, a raw diet would be best, including muscle meat, organ meat, bones and non-starchy vegetables, although the veggies really aren’t necessary. It also means carbs, because carbs convert to sugar. Illminating white and sweet potatoes, corn, rice and wheat is a good start. Read those ingredient lists!! 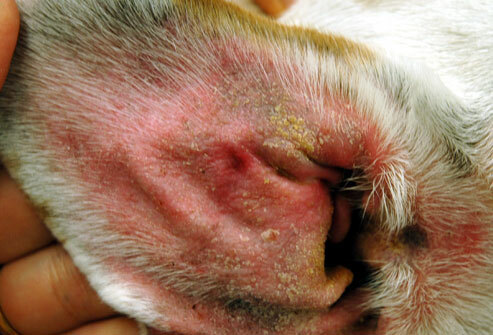 Disinfect: If you just keep putting anti-fungal creams on your dogs sore ears or other areas and not removing and cleaning the area, you just get old yeast piled on old yeast which can become a bacterial infection fast! A common disinfectant wash that does not need to be rinsed after use is a gallon of water to one cup of hydrogen peroxide and one cup of white vinegar. This wash is especially good for feet and should be used everytime your dog comes in. Mixing it in a washtub and having them step into it is the best way. There is no way to “wipe” the yeast off of a dog’s feet effectively. Be sure to dry well after. To disinfect ears, Witch Hazel on cotton balls works really well. Witch Hazel is also an anti-inflammatory. Essential Oils: Two in particular are really good anti-fungals. Oregano and Bergamot. Both should be diluted with a carrier oil before applying. Baths: Using the abovementioned essential oils in your dog shampoo is helpful, but there are also a few commercial brand ready-made anti-fungal shampoos on the market. They are listed in no order of preference.